Strain is defined as a change in length expressed as a function of the length being changed i.e. In a linear elastic material the strain increases linearly in relation to the increase in stress. Similarly in a 100% elastic material, when the stress is reduced the strain recovers down the same linear path. Deformation in an ideally elastic material is totally recoverable. Once the stress is no longer applied, the object returns to its original shape. Deformation in an ideally elastic material is totally recoverable, as for example in the passage of a heavy wheel load. Strain is defined at a point, whereas deformation is defined as the change itself. In a pavement we are usually interested in the vertical change in position at the surface (e.g. due to a vehicle passing). In this, the deformation of the surface is the sum of all the vertical strains at every point beneath the surface. These can be a result of compressive forces, tensile forces, shear, bending or torsion (twisting). Plastic deformation is not recoverable. However an object in the plastic deformation range will first have undergone an elastic deformation, which is recoverable, so the object will return part way to its original shape. 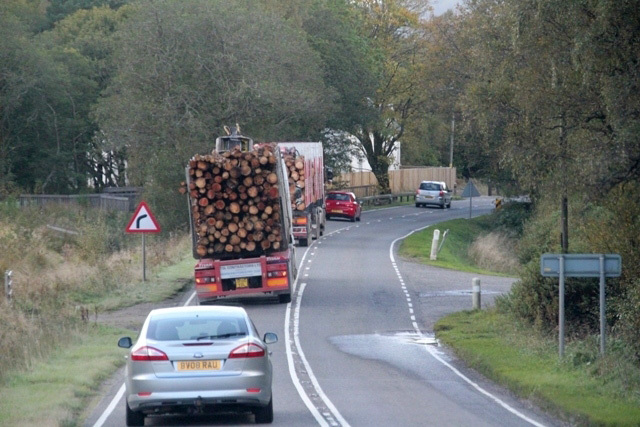 On a low volume road the response to a heavy wheel load is always a combination of resilient deformation and a very small proportion of permanent deformation. Road construction materials are not ideally elastic and they will accumulate some amount of permanent deformation as a result of every load application. The combination of resilient and permanent deformation under repeated LOW levels of stress. The red horizontal line indicates the failure stress level. At the start of loading the strain increment is at first high due to the initial compaction of the aggregate but soon settles down to a constant low level. the stress conditions to which the material is exposed, especially the intensity of shear stresses. At low shear stress level the permanent deformation is likely to stabilize while at high shear stress level it may keep on accumulating continuously. The combination of resilient and permanent deformation under HIGH levels of stress close to the failure stress level (the horizontal red line). The strain increment is high from the start of loading. 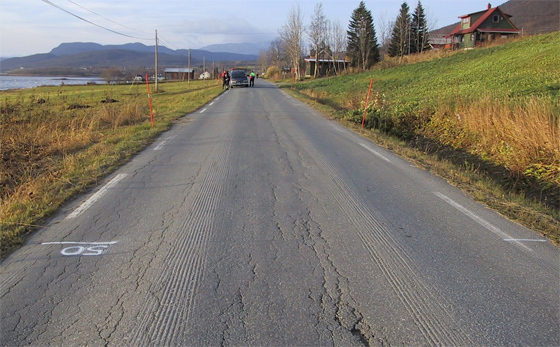 The ROADEX project has shown that in the Northern Periphery permanent deformation is the main cause of undesirable rutting on low volume roads. This rutting causes many kinds of problems to road users and road owners. 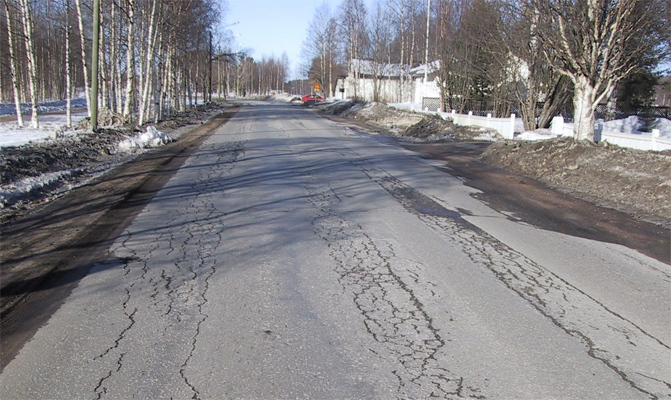 Rutting of the aggregate and/or subgrade layers in a road can lead to failure of the upper asphaltic layers. 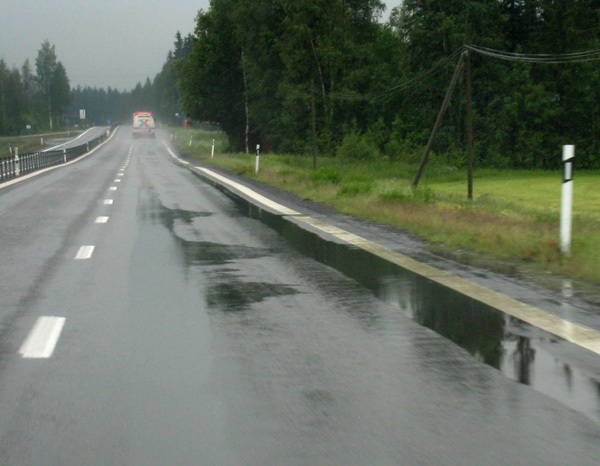 Where this happens, instead of draining off, the surface water in the rut infiltrates into the road structures and subgrade beneath the pavement causing them to soften. 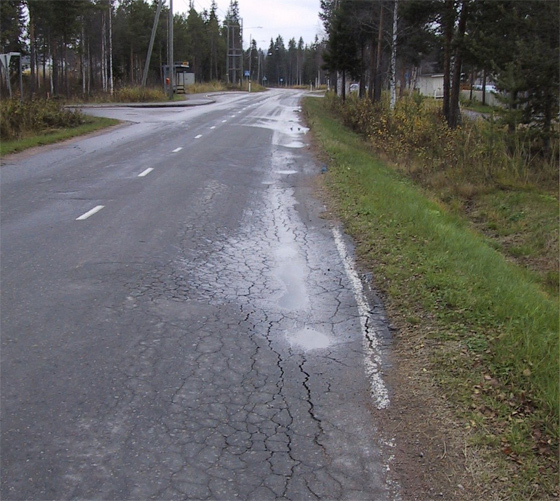 Because of this, rutting is seldom uniform along the length of a road and unevenness in the road surface can arise leading to greater roughness levels and user discomfort. 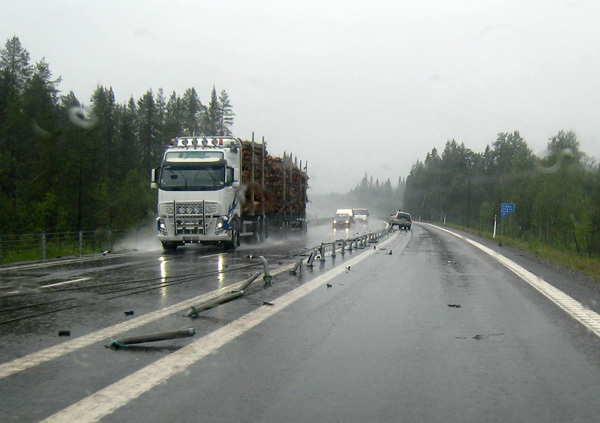 High rutting can also cause extra costs to road users. More friction is developed against the side of the tyre leading to higher rates of fuel consumption and tyre wear. 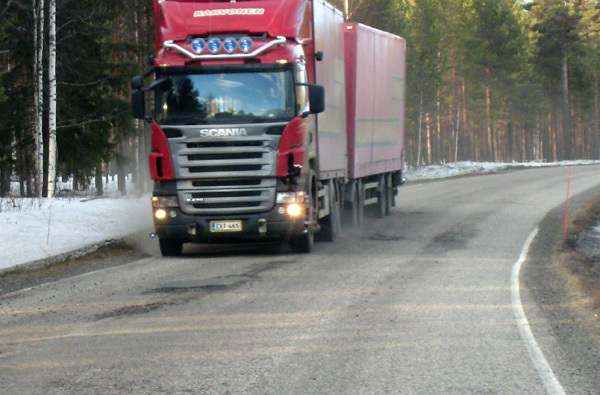 Deep ruts cause faster wear rates to the sides of tyres increasing transport costs to truck owners. Ruts cause other types of problems to road owners. 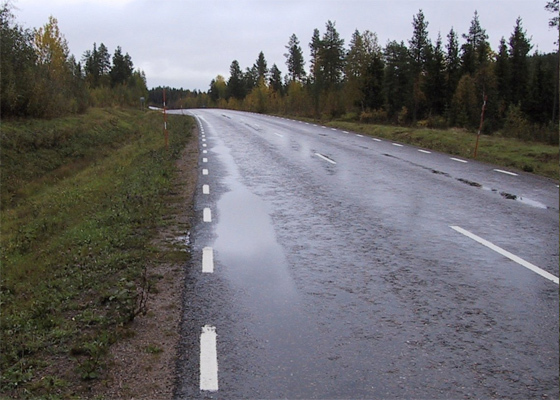 In Scandinavia, where studded tyres are used, the wearing rate of the asphalt surface increases significantly and create deep ruts that collect water and decrease the pavement lifetime. Standing water in the bottom of ruts increases the rut wear rate per vehicle and so reduces the life time of the pavement. 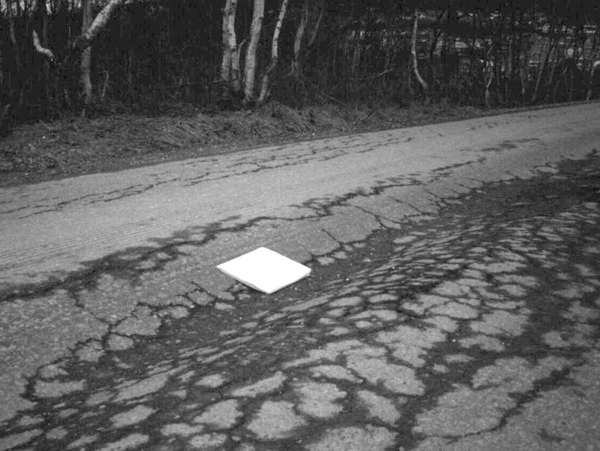 Ruts also create problems for the removal of ice and compacted snow during winter. This can be a very difficult operation with graders or underblades and can cause damage to the pavement.